Christmas is a time of great blessings – a time when God’s abundant goodness is poured out on his people as they celebrate the coming of the promised Messiah in the birth of Jesus Christ in Bethlehem. Each year during the Christmas season we have a unique opportunity to allow God to open our hearts and fill them with his healing grace. Often we think of Christmas as being one special day of the year when we receive material gifts from those we love. Christmas is far more than that. Christmas, in fact, lasts for 12 days, providing an opportunity to receive God’s blessings throughout this season of peace, hope, joy, and love. Take these next 12 days and reflect on the blessings you might be given by God this year. God is always aware of our needs. He is ready and willing to help. Are you open to his grace? Let’s reflect on some of the many blessings God may bestow on us this year. This may be the year in which you receive a special blessing that could change your life forever. The gift of Faith. Perhaps you live with fear, worry, and doubt. This may be the year you learn to depend on God through the blessing of faith. The gift of Hope. Perhaps you struggle with depression and despair. This Christmas season may instill in you a glimmer of hope that lasts throughout the coming year. This Christmas may help you realize that you are forgiven by God and you have the hope of eternal life with him in heaven. The gift of Charity. You may be filled with criticism and judgment or bitterness and resentment. God’s Christmas blessing may fill you with forgiveness and love. The gift of Light. Your addiction may have caused you to journey into the darkness – a darkness from which you could not escape. Perhaps the Light of the Christmas season will restore the light that dwells inside you and surrounds you. The gift of Courage. The journey of recovery involves hard work. It requires patience and perseverance. You need diligence to combat the sin of sloth and stay strong in your recovery. Perhaps this is your Christmas gift this year. The gift of Prudence. This moral virtue helps you discern the truth and make good choices. It keeps you attuned to temperance and helps you say “no” to temptation. This may be the grace that fortifies your recovery this year. The gift of Wonder and Awe. Perhaps you are too serious and you have forgotten the wonder and awe you had as a child. 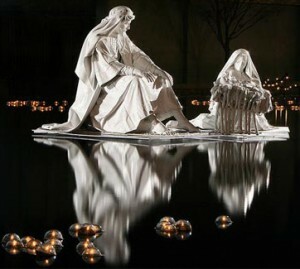 This Christmas could restore those child-like graces and change your whole perspective on life. The gift of Gratitude and Appreciation. Perhaps you have grown distant and cold and your heart is far from God. God’s Christmas blessing can fill your heart with warmth and understanding. It can provide kindness and compassion. It can help you open your heart and learn to trust again. The gift of Comfort and Consolation. Perhaps you have suffered a great deal and you feel sadness and oppression or abandonment and rejection. God’s grace may give you the courage to turn to him for comfort in your time of need. That comfort may provide the consolation that will make you strong in your faith and engaged in your recovery. The gift of Purpose. Perhaps you have lost your way or you have never really found a purpose for your life. Your Christmas blessing may include a deep commitment to building your relationship with God, and the outgrowth of that bonding may inspire you with an understanding of how you are called to serve God and his people. The gift of Joy. Perhaps you have allowed someone or something to steal your joy. During this season of joy you may have the insight and the courage to reclaim that joy and protect it as a great blessing in your life. The gift of Peace. Perhaps you have allowed your own thoughts and feelings to disturb your peace. Perhaps others have interfered with your ability to find and claim peace. This may be the year in which God grants you peace in abundance, restoring you and your relationships with Him and others. Which of these Christmas blessings does God have ready to bestow on you this year? Which one do you want to ask him to give you to help fortify your wellbeing and make you stronger in your recovery? Remember there are 12 days of Christmas. Open your heart and count your blessings as you reinforce your relationship with God through this special time of the year.